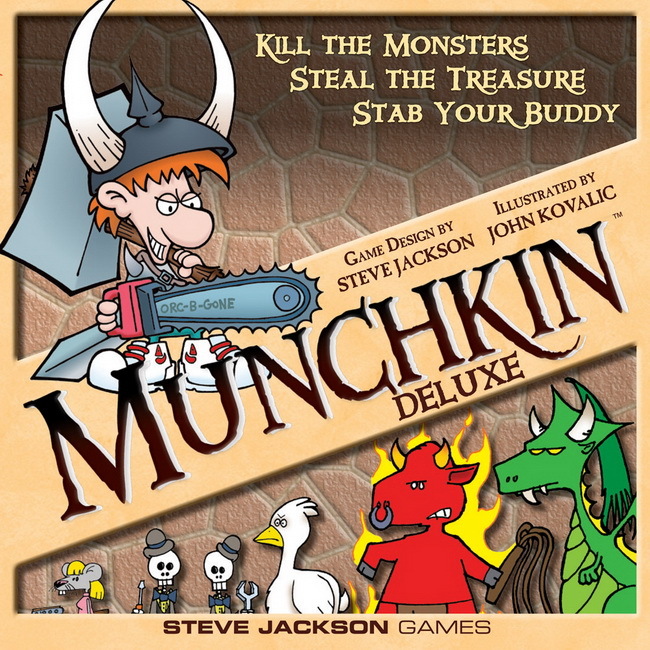 Steve Jackon's Munchkin occupies a special place in the gaming world. It's a quirky little game derived from an RPG insult/accusation for characters that are perfectly designed for combat or something without too much care for the role-playing aspect things. Creating a "munchkin" isn't exactly a bad thing, but at times it can be considered to be unimaginative. Munchkin as a card game tries to capture the experience of fighting monsters with your little character as you work on increasing your level and gathering more treasure. The monsters are ridiculous long with everything else in the game, and that's the fun part of it all. This Deluxe edition of the game tried to address a few of aspects of the game that weren't fully addressed in the initial release like providing an easier way to keep score and such. But it's still the same level of Munchkin goodness that helped start an entire franchise. Synopsis: Munchkin Deluxe is a re-release of the now classic Steve Jackson card game with a few additional components. The original game strictly consisted of cards while this edition includes a game board that can be used for scoring along with 6 plastic figures to represent your little munchkin heroes. And you also get little player cards to represent which color figure is yours and to keep track of your gender. The rules of Munchkin are simple enough - each of you are in a race to get your character to Level 10 before all the others. The easiest way to gain levels is by defeating monsters - and to make that final climb from Level 9 to Level 10 requires that you defeat a monster. Other ways of gaining levels are through cards or by selling items worth 1000 gold pieces. Turn order is easy enough to follow. First you explore a room by kicking open the door, which means drawing a Door Card. If you draw a monster card, you now have to fight it, which means having a level higher than the monster. You start at Level 1 but you also get an initial set of cards that can include items and other bonuses to get you to a higher level. If you can't defeat the monster on your own, you can try to ask for help from another player typically in exchange for a share of the treasure gained by defeating the monster. Typically only the main player gains a level from defeating a monster, but there are cards that play around with this. Other Door Cards can include bonuses for your character or curses that deal out penalties right away. At any time you do not draw a monster you can then draw a second card into your hand, which is looting the room. It won't gain you a level, but it will give you more options. Another action you can take when a monster is now revealed when you kick open the door is to play a monster card of your own (looking for trouble), which we assume is one that you can defeat without help. The game includes both class and race cards, similar to a traditional fantasy RPG. These classes and races have different attributes that can give you bonuses in the game. But at the same time, certain monsters are more effective when facing certain classes, races or even genders so hings can go either way here. Ultimately you're going to take as many bonuses as you can in order to give you the ability to defeat anything hiding behind the door. The game seems friendly enough and maybe for the first 5 levels or so players are still very much willing to help others out with minimal bargaining or haggling. But as you get to the final stretch, then you'll see players throwing all sort of cards into the mix including increasing the level of a monster or adding additional monsters to the encounter. Given enough players, a game can extend to several hours as people throw card after card in the way of other players until everyone is tapped out. The game maintains a silly, humorous tone as seen in the rules and the different cards themselves. The game can have you fighting something as simple as a Potted Plant or as significant as a Level 20 Plutonium Dragon. The Kneepads of Allure might be able to sway other players to help you or you can reduce the threat of a monster by turning it into a baby. The game provides a wide variety of options that will enhance your game and keep things interesting. There are a ridiculous number of game variants and expansion sets for the game that just add to the craziness. You can theoretically mix up different Munchkin variants to create even crazier game play, although personally I prefer to avoid mixing across variants just for the sake of sanity. There are also epic rules that have players trying to race to 20, but given how long our standard games go, I'm not sure if I'm ready to go that far. Munchkin Deluxe is a great version of the original game that makes scoring a lot easier given you have visual character miniatures to represent your progress in the dungeon. It's an easy game to learn with a wild element of chance to things but still enough room for some strategy. The game gets 4 crazy monster cards out of a possible 5.